All the other halves of the triangles I cut up yesterday were just sitting there, looking at me with that sad, "You're just going to toss us out, aren't you" look. I couldn't in good conscious let them suffer the ignominy of such a prodigal end, so they became another pillow. I had just enough medium-dark gray to finish it, too, which gave me a double-dose of satisfied frugality. This wasn't one of my original designs but I figure hey, better than what I had. Next week I'll get to some of the other designs I planned on. I like it very much, both the fabrics and the pattern are great. 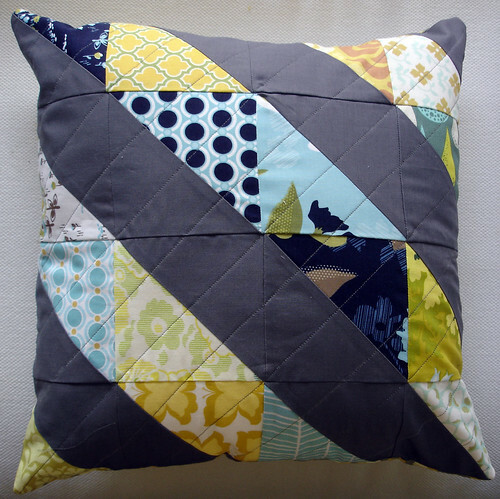 Don't you love leftovers:) Your pillow looks fabulous and I like how you have quilted it!